Choose your own path with a Custom Itinerary. Create your dream holiday with a little help from our NZ Travel experts! You can give us as much or as little information as you want - Let us know what you have in mind! New Zealand’s largest city Auckland is a modern, vibrant place, a melting pot of culture, particularly from the South Pacific nations. The city is nestled between the Waitemata & Manukau Harbours meaning Aucklanders are never more than 30 minutes drive from the coast, making it an aquatic playground aptly hailed as "The City of Sails". Beautiful, unspoiled and wonderfully rich in history and culture - At the top of the North Island, a vast marine wonderland abundant with wildlife, unspoilt coastline and pristine rainforest. This large area of offshore islands is the perfect spot to charter a boat, hire a kayak or take a cruise to enjoy this magnificent maritime playground. The Coromandel has long been a favourite holiday destination for "kiwis" but it is only in recent times that the international visitors have realised the sheer beauty of this hidden gem. The very scenic 400 km coastline encompasses a rugged mountainous interior cloaked in sub tropical rainforest & is home to a thriving arts community. Horticulture heaven above the ground and sculptured masterpiece below - The Waikato region has everything from magnificent parks and gardens, glow worms, caves to a thriving cultural precinct, Hamilton offers a mix of leisure, lifestyle, rich history and a selection of activities awaits all visitors. Located on the east coast of New Zealand’s North Island, the Bay of Plenty is a great year round destination with beautiful harbours & long white surf beaches. About an hour inland lays Rotorua, famous for its rejuvenating spa treatments and dramatic geothermal landscape. Rotorua is also a major centre of Maori culture and eco tourism. The first early European landing place in New Zealand - Relax by the waterfront with a glass of Gisborne wine and you will feel like it’s heaven on earth in East Coast (also known as Eastland). Visitors to this region best jump in a car and travel along State Highway 35 one of the Southern Hemispheres awe-inspiring coastal road trips. Take the road of the ancient Maori ancestors and discover stunning landscapes and sights as you explore this region. Visit the lakeside town of Taupo, the World Heritage listed Tongariro National Park and Mt Ruapehu, an active volcano that happens to be North Island’s highest peak and a popular skiing and hiking destination. The mountain to surf experience - Encompassing a variety of landscapes including the dramatic snow-capped peaks of Mt Taranaki, steeped in maori history and blessed to be on the sunny coast, Taranaki is a sacred place to visit with many attractions and sights to enjoy. Beaches, Culture, Fine Wine, Cycle Trails and Art Deco - Spread across 360 kilometres of pristine coastline, Hawkes Bay has a wide selection of things to see and do. From surfing to fishing, cycling to wine trails, Art Deco heritage walks to amazing gardens, adventure to Maori cultural heritage. The heartland of the north - Surrounded by mountains this area displays an inspiring naturally beautiful landscape, with breathtaking west coast beaches, unspoilt bushland and an array of wilderness experiences. If you like the country life then you will enjoy your time spent in this region. One of New Zealand’s top food and wine destinations - Only 1 hour north of Wellington, Wairarapa is famous for its smorgasbord of gastronomical delights with many cafes, restaurants and vineyards. NZ's ultimate urban destination - The nation's capital is an unforgettable city nestled between a beautiful harbour and rolling hills. Well known for its vibrant and lively nightlife and world-class culinary pleasures, Wellington is a compact little city with a big heart. Presenting an array of cafes, gourmet & alfresco restaurants, funky cafes, nightclubs and more. Spoilt with golden beaches, crystal clear waters, an abundance of wildlife and 3 national parks - the most well known being the Abel Tasman National Park. Nelson has a culture of creativity and heritage, with many studios, galleries and workshops opened to the public. Also waiting to be discovered are the many local vineyards in the west of the Nelson region. Visit Otago and you will be met with a mountainous region, glacier-fed rivers, sandy beaches and wide open plains. Rich in history and culture, beautiful landscapes, abundant native wildlife, gastronomic delights, magnificent mountains for skiing, summer hiking, hunting… Otago is a truly a region of contrasts. Tucked away at the bottom of the South Island, Fiordland is home to many of New Zealand’s scenic icons – Milford Sound, Doubtful Sound, Mitre Peak and the Great Walks. Expect breathtaking scenery, majestic snow capped mountains, glowworm caves, magnificent lakes and rivers, towering waterfalls, scenic walking tracks, abundant wildlife and so much more. An island sanctuary - the third largest island in New Zealand, Stewart Island is located 30 kms off the South Island coast. A wilderness haven for the native Kiwi, mohua, rifleman and the Stewart Island Robin. 85% of Stewart Island is National Park. Walkers and hikers enjoy tramping in the National Park, through the native bushland and coastal tracks. 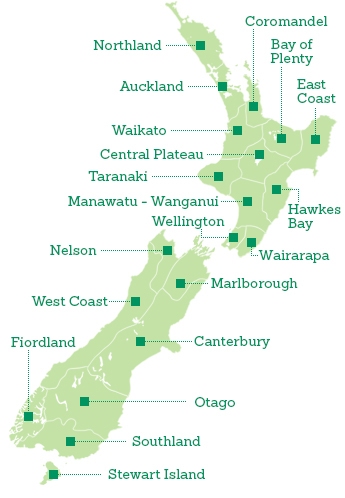 Do you know the places you want to visit in NZ? Please provide a detailed list of what you would like us to give you a quote for.